Leupold 54690, 60070 Mark 4 8.5-25x50mm LR/T M1 Tactical Riflescope FREE SHIPPING! The Mark 4 4.5-14x50mm ER/Tactical M1 Front Focal Scope is versatile long-range optic upgrade optimized for hunters, marksmen and tactical operatives. Its adjustable zoom allows users to quickly switch between image magnifications to create the perfect sight picture for targets at changing distances. As the zoom increases so does the reticle, allowing shooters to accurately estimate target distances regardless of magnification level. The scope utilizes an index matched lens system that concentrates all available light rays to create brighter images with enhanced clarity and color differentiation to ensure maximum visibility no matter how far away the object is. A waterproof body constructed from military-grade aluminum provides the ruggedized exterior needed to withstand the demands to perform in any environment. 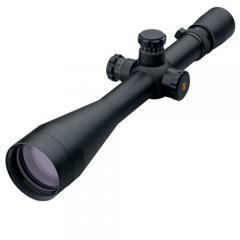 ©2002-2019 CopsPlus.com: Leupold 54690, 60070 Mark 4 8.5-25x50mm LR/T M1 Tactical Riflescope FREE SHIPPING!